A fascinating, thorough historical insight into the ongoing relationship of British and American abolitionists, which opens up the minutiae of politics of the day to the modern reader. 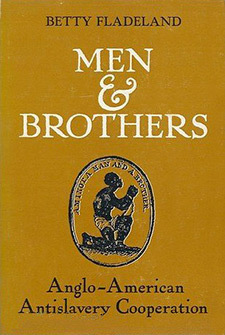 It is invaluable for its investigation of the see-sawing between the two nations as it grappled with “the peculiar institution,” and how the abolitionist camps of both countries sustained and supported each other as the two governments came to the elimination of the slave trade, colonization of Africa, and emancipation. A source of encouragement for every activist faced with long odds, wealthy and powerful counterparts. Fladeland was instrumental in establishing the Black American Studies program at SIUC in 1968 and taught some of the very first courses offered in that program of study. She was one of the first presidents of the Society for Historians of the Early American Republic. She was elected in 1984 and served for a year. In 1983, the Friends of Morris Library at SIUC named her a Delta Award Winner for “contributing to an understanding of the battle against slavery.” The Organization of American Historians also recognized her as a distinguished member. Fladeland was a native of Minnesota, graduated from Duluth State College in 1940 and earned a master’s degree from the University of Minnesota. She earned her doctoral degree from the University of Michigan in 1952. Her teaching experience included Wells College in New York, Central Michigan University and Central Missouri State College. She joined the faculty at SIUC in 1962, where she was recognized as a Distinguished Service Professor. She was the author of articles and three books about the anti-slavery movement. The books, James Birney: Slaveholder to Abolitionist (1955), Men and Brothers: Anglo-American Anti-Slavery Cooperation (1972) and Abolitionist and Working Class Problems in the Age of Industrialization (1984), continue to appear in current bibliographies.